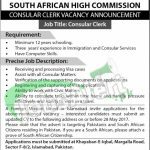 Have the current career opportunity from South African High Commission Jobs 2017 For Cosnular Clerk Later. For all those unemployed applicants now I am going to flip the job update from the South Africa High Commission in Islamabad is looking to recruit the eligible, dynamic, energetic and well qualified applicants are required to apply for the post of (Consular Clerk) is the vacancy which needs to be filled in Islamabad is willing to recruit such eligible applicants for this post. As I have disclosed the vacancy before you so now let's reveal the qualification for this post which include 12 year's schooling with 3 year's experience in immigration and consular services is required to fill the needs of this post with computer knowledge and number of the skills are required to hold such post with perfection. Awesome salary package will be given to the applicants with the good and collaborative environment will be given to work over there. Now, I will let you know about its applying method below. Interested and willing applicants are required to apply by submitting the CV should be sent to the said address. Last date for applying is 28th May 2017. Only eligible and caliber applicants who posses all the amenities will be hired. The authority reserves the right to increase or decrease the number of posts. This commission invites all applicants and South African citizens residing in Pakistan are eligible to apply. So, keep in touch with this page and have a strong connection by visiting it daily for all sort of jobs from all sectors and get all the jobs fresh with all details. So, have a look to this page and you will lost in it to find all sort of jobs. Stay tuned with JobsAlert.pk. Address: The South African High Commission, at No, 48, Khayaban-e- Iqbal Main Margalla Road, Sector F 8/2, Islamabad.